1. Eurovision is full of comedy value. Amidst the actually-very-good-and-if-Taylor-Swift-sang-it-it’d-be-number-one-for-a-month songs, there are plenty of moments that are geared towards making you giggle. In a glorious moment of Eurojustice, the two prime curators of 2013’s giggles have been flown over from Sweden to do more of the same. 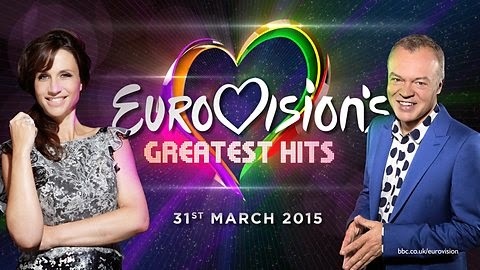 Whilst only the Swedes (and Youtube searchers) will be able to enjoy Lynda Woodruff, the entire show was presented by the fabulous and ferociously funny Petra Mede alongside Graham Norton whose sarcastic wit finally took centrestage. It’s been a long time coming, too, as Petra was more than happy to point out. 2. It’s no secret that Rosa Lopez and Natasha St-Pier aren’t as well known as the likes of Lordi and Conchita, but that has only stoked the fire in their bellies. They nailed their performances and were just as entertaining as the big names. Forging together the English and French versions of ‘Je N’ai Que Mon Ame’ (‘All I Have Is My Soul’), Natasha’s soaring vocals were one of the highlights of the entire evening. Rosa, meanwhile, treated the crowd to a medley of Spanish entries, culminating in her own ‘Europe’s Living A Celebration’ popathon. It’s no ‘Euphoria’, but it gets the adrenaline pumping. 3. The two Danish winners gave very different performances. Opening up proceedings, Emmelie De Forest coated the floor with dry ice and surrounded herself with drums to give a booming take on her euphoric 2013 winner ‘Only Teardrops’. The Olsen Brothers gave a much more intimate and stripped back delivery of ‘Fly On The Wings Of Love’ with just a few twinkling lights as their prop of choice. They didn’t need much else though, the song is still warm and vibrant enough to warrant a mass sing-a-long for it’s final chorus. Bad news for anyone hoping for a DJ Sammy cameo though. 4. Germany’s Nicole delivered the Ralph Siegel masterpiece ‘Ein Bisschen Frieden’ (‘A Little Peace’) which felt as poignant and relevant today as it might have done at the time of its win. On a cheerier note, Nicole enjoyed the crowd reaction so much she had to be ushered off stage. Awww/Hahaha. Anne-Marie David also enjoyed demonstrating what little effect time has had on the majesty of ‘Tu Te Reconnaitras’. Judging from the cheers, the resonance it has on the audience hasn’t shifted much either. 5. What can be said about Lordi that hasn’t already been said? Their performance of ‘Hard Rock Hallelujah’ was as epic as always as they made good use of any fireworks that went to waste over the new year. Save for the end of the show when Lordi join their fellow winners for a cover of ‘Waterloo’ by Abba. No, really! 7. Dana International made a stunning entrance through the backlit doors. Whilst ‘Diva’ would benefit from a slight rework of it’s verses, the anthemic chorus is unbeatable and proved, with it’s relentless sing-a-long nature and pyros, to be an unforgettable highlight. Dana also made no secret of how much she was enjoying the crowd’s attention, particularly during the ‘encore’ medley in which she appeared alongside Conchita with a grin of knowing that they were sending the gay world into a frenzy. 8. Herreys’ performance early in the show was all dance routine and golden shoes pulled off with as much enthusiasm as when they first won the contest. Upping the ante even further, Norway’s Bobbysocks looked like they were having the time of their life as they were given another chance to perform ‘La Det Swinge’ for Europe. Their brimming positivity proved just as infectious as the song itself. 9. Inevitably, the reaction to the word ‘Russia’ provoked the worst reaction of the night for poor Dima Bilan. After a telling off from Graham however, most of the negativity dissipated and Dima’s performance of a mash-up of his two Eurovision entries was given the deserved respect, even if he did oversing a little bit. On the other side of the scale, homeland champions Brotherhood Of Man received a glorious standing ovation as they relived ‘Save All Your Kisses For Me’. Likewise, Johnny Logan was treated to a roaring response as he ticked off his three winners singles, ‘What’s Another Year’ and ‘Hold Me Now’ being standouts as they demonstrate effortlessly how an emosh ballad is pulled off. 10. Loreen. LorQueen. The modern Eurovision icon. Dramatic and dark, the performance from Sweden’s finest diva was pretty different to the simple ‘Euphoria’ renditions we’ve seen before. With the best use of staging throughout the whole evening, Loreen was surrounded by dancers draping lengthy black sheets from above. There was billowing. There was drama. Loreen, once again, did not disappoint. 11. Arguably one of, if not the, most talked about Eurovision winner, it felt like the entire evening was geared towards Conchita Wurst’s finale performance. Signalling the end of the show and a look towards Vienna in May, Conchita received the best reaction of the night. It was a fitting finale too, an epic crescendo tinted with a nice reminder that, after sixty years, Eurovision is still as exciting, intriguing and unpredictable as ever. 12. Oh yeah, there was some riverdance as well.